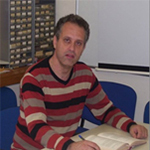 A.G. Kontos studied Physics in the University of Athens (BSc) and the University of Warwick (PhD). Since 2007 he is working in the ‘INN Demokritos’ in the Nanotechnology processes for solar energy conversion and environmental protection Laboratory. His main fields of research are perovskite and dye sensitized solar cells, photocatalysis and superhydrophilicity of TiO2 materials as well as CO2 capture and conversion. His interests include synthesis of TiO2 in several morphologies, their modification with anion doping, functionalization with metals and carbonaceous materials and sensitization with dyes and quantum dots. He is expert on vibrational, optical and morphological characterization of nanomaterials, thin films and solar cell devices. Nanostructured modified TiO2 was synthesized using the gel combustion method based on the calcination of an acidified alkoxide solution mixed with urea. The hybrid inorganic/organic material shows exceptional physicochemical properties and significant photocatalytic activity in the visible spectral range attributed to sensitization of the TiO2 by a thin porous layer of carbonacious species in controlled core–shell morphology. The modified titania was dip-coated in ultrafiltration membranes and incorporated in a water purification photocatalytic reactor in continuous flow filtration conditions. Furthermore the new photocatalysts have shown very high efficiency in photocatalytic CO2 conversion to hydrocarbons under solar light irradiation.